If you spent the entire summer singing “Everything Now” or you have been their fan since “Ready to Start” or “Rebellion”, we have got really good news for you: Arcade Fire is coming back to Madrid in 2018. 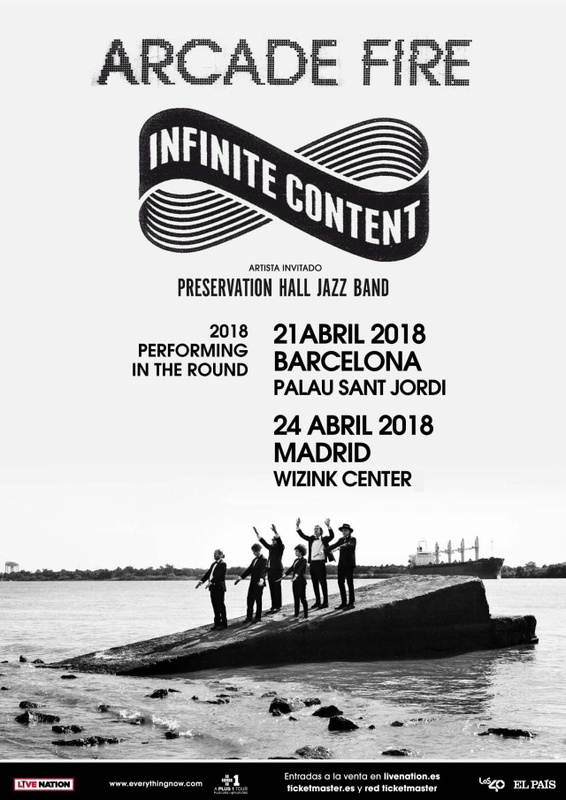 Next April 24th in the Wizink Center the world-famous indie rock band Arcade Fire will offer a concert that is part of their world tour Infinite Content. The tour started last summer when they surprised everyone at the Primavera Sound Festival. It has been seven years since the band came to Madrid when they were presenting their third studio album The Suburbs, back then, the tickets ran out quickly and the show became one of the most commented and praised in the year. Not in vain are celebrated as one of the best bands in the world right now. Arcade Fire will not be alone that night, the mythical jazz band Preservation Jazz Hall Band from New Orleans will open up the concert filling the air with a spectacular performance just like they have been doing for more than 50 years, they have worked alongside bands like Foo Fighters, My Morning Jacket and of course Arcade Fire themselves. The tickets for Arcade Fire concert are available on ticketmaster.net or the ticketmaster network in Madrid, the prices range from 40 to 60 euros.